Bleu Royale is a daughter company of CrownRing. Just as the parent company is renowned for high-quality, unique designs, this new line boasts expert craftsmanship and one-of-a-kind styles. This particular brand specializes in intricately detailed men's wedding bands. The luxurious bands are available in multiple precious metal shades. The distinct designs are crafted as a solid color or two-tone, and they can be adorned with various gemstones, inlays, and textures. These beautiful bands are perfect for celebrating the endless love shared in a marriage. All Bleu Royale wedding bands are available in 14-karat rose, white, and yellow gold. Some bands are unadorned but highly polished for sophisticated shine. Among the two-tone bands, colors often vary between the inner and outer faces of the ring. Many designs incorporate precious gemstones. White diamonds may be used alone as single embellishments or in a line to create sparkle and fire. Black diamonds lend a slightly more masculine appearance, and deep blue sapphires take center stage in a number of designs. For a pop of color, several ring styles combine white diamonds with black diamonds or sapphires. Some of the most distinctive Bleu Royale designs feature inlays of alternative materials. Black carbon may be used to create defined lines along a gold band or complement black diamonds. 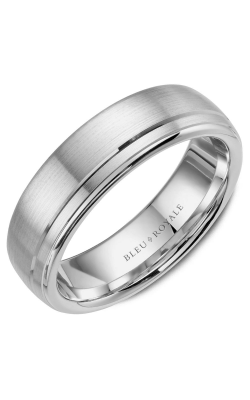 This nontraditional shade sets the band apart from other common men's wedding bands. Hi-tech ceramic provides the same look in solid colors or galaxy-inspired waves. Burnishing, hammering, crackling, and etching give bands unexpected texture. Milgrain and rope details along the edges of the ring band add visual interest to a solid color ring or create a division between metal colors. Many rings are contoured with subtle indentations around the edges or in the center. Why Shop for Bleu Royale at Clowes Jewellers? Clowes Jewellers is located in Red Deer, Alberta. By serving Red Deer and nearby Edmonton and Calgary with unparalleled service, we have earned the tagline “Where Central Alberta Gets Engaged.” Since 1978, we have been an authorized retailer of wedding jewellery designers including Carlex, Noam Carver, CrownRing, and Hearts on Fire. We also carry fine fashion jewellery by Alex and Ani, Michael Kors, and Kate Spade. Citizen and Tissot timepieces adorn our showroom as well. For more information on our products, services, and events, please visit our website or call (403)-346-2720. You may also stop by our store in the Bower Place Shopping Centre.